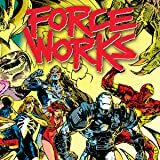 Collects Force Works #1-11, 12 (A story), 13-15, Ashcan Edition; Century: Distant Sons #1, and material from Iron Man/Force Works Collectors' Preview. 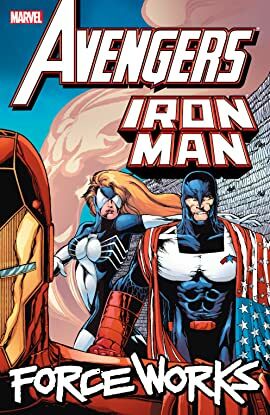 Before they reinvented the Guardians of the Galaxy, Dan Abnett and Andy Lanning transformed the Avengers West Coast into Force Works! And fueled by the Scarlet Witch's uncanny hex powers, this new team is going proactive! But who's in charge: Wanda or Iron Man? As tragedy strikes, one Avenger won't live to work with this forceful new group for long. With the squad in need of a new powerhouse, will the enigmatic Century fit the bill? He'd better, in light of deadly threats including the invading Kree, alien scavengers and the cyborg Black Brigade! Will Force Works meet defeat at the hands of the Mandarin and his Avatars, or live to see a reunion with the Avengers? They're not Avengers...they are Force Works. And with a new mission, Iron Man and his fellow heroes fight to save the future.